There are several similar species of Eleodes in the Desert Southwest that take up this defensive posture and are known as Pinacate Beetles. This one was observed in Sonoran Desert habitat at Pained Rock Mountains, Maricopa Co., Nov. 1, 2008. Also known as stink beetles. 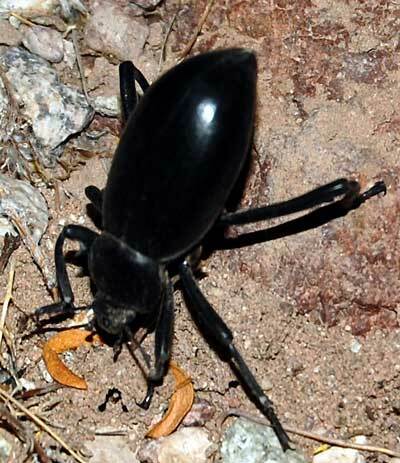 When threatened or attacked pinacate beetles can spew a brew of quinones and other noxious chemicals from the posterior of their abdomen. The beetle equivalent of a skunk. If the beetle senses a threat it thrusts its behind high overhead prepared to shoot an attacking insectivore square in the face or mouth. These long-lived residents of the Sonoran Desert are a common site as they travel frequently in search of food or mates. They can be maintained in a terrarium for a year or more and are fed easily with vegetable or fruit scraps. The immature stage is a grub that lives in the soil feeding mostly on decaying vegetation such as dead root systems of trees or cacti. They are commonly known as wire worms, a name applied to the larval grubs of several related beetle families. The defensive posture suggests the mountain of the same name, El Pinacate, that soars above the desert in Sonora, Mexico.